Author Michelle Madow pitched her new book, The Secret Diamond Sisters to me a few months ago and right away I knew I had to read/review it. Having worked with Michelle previously and after reading a couple of her other books I was excited to read this one. The whole premise of the book was outrageous! Three sisters become reunited with their long lost Father and become filthy rich all in one day. What's not to love? A dream come true! To have unlimited wealth to be able to purchase pretty much anything is something I know most of us only dream of, myself included. My initial thoughts: "THIS IS GOING TO BE EPIC!" To describe the story in two words, they would be: Great Potential. Right from the beginning I was hooked, no not hooked, more like engaged. Right away you meet "the sisters", and right away something happens to end up leading them to their Father in which they have not seen since babies. Without much of a choice Savannah, Courtney, and Peyton are whisked away to the city of lights, Las Vegas and home of Daddy "Warbucks" Diamond. Each given their own penthouse sweet, a shiny new gold credit card, and not a clue about the man that is their Dad. Shopping spree's, spa days, VIP clubbing, and now with their new prestigious title, The Secret Diamond Sisters are who everyone is talking about. Between the hot guys (and potential boyfriends), the money and fame these three sisters soon come to find out more about their pasts, and why Daddy dearest had to stay away. Savannah- For me she was the most likable character. Savannah behaved a lot like I would have done in her situation. Spend the money, meet hot guys and live it up! She was the sister to adapt to this new lifestyle the quickest and also tended to be the most upbeat sister in the book. I will say she was a little naive when it came to Vegas boys; rich, handsome and don't understand the meaning of the word "NO". At times, Savannah was to quick to say yes, and often to agreeable. All in all I felt Savannah took well to her new life and was the most enjoyable character. Courtney - A quite, simple and one of the most down to earth girl you'd ever meet. Smart college bound Courtney was often shy and underestimated throughout the book. She didn't feel right about spending her Dad's money. She often turned down shopping with Savannah. You find out a big secret about Courtney that even she herself didn't know about. I was slightly bored with Courtneys' character. I wished she would have lighten up and have some fun. Peyton - Ah, where do I begin... *sigh* Peyton was my least favorite of the sisters. She always had a bad attitude, and a snide comment for most everything. A rebel through and through. She was not at all happy about meeting her Father, and had no problem showing her discontentment. Payton managed to hoe it up with the first guy who showed interests in her. She hated her Father and his money, wanting nothing to do with either of them. The backdrop to the story, Las Vegas. I have never been there but would one day love to visit. I really enjoyed all the places the author took her readers throughout the book. Hotels, clubs, museums, theatres, and a vast look into the heart of the city. The Nightlife. Overall I loved the idea of the story. Three girls find their long lost Daddy and with that comes wealth, excitement, and new adventures. I was really intoxicated by the sisters new lives and what would happen next. How they would handle new things, new guys, and seeing this new life change each of them so differently. Sadly, there were quite a few things I did not like about this book. First and foremost, THE POINT! Meaning, where was the story going, where does the climax happen, and simply "Now What?" The story at times was kind of sub par. I felt there was really not much of a point to the story in some cases. Yes, the girls were reunited with her Dad. Yes, they now are rich and popular and yes, jealousies and boy trouble are enviable. There was not a lot else going on. I wanted to see more between the girls and their Father, and less drama. I was bored at times and found myself picking up another book to read. Sufficed to say, I wanted more! 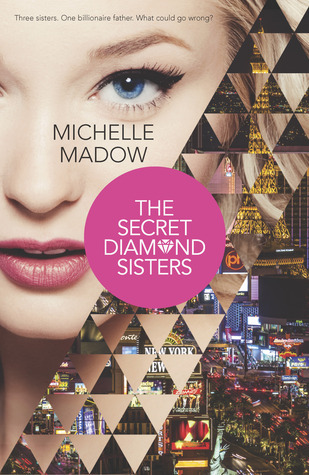 The Secret Diamond Sisters by Michelle Madow was a fun read. It had it's ups and downs. I didn't LOVE the book but honestly didn't hate it either. I guess you could say I'm someplace in the middle. Would I read book 2? Of course! Even with it's lack of story progression I truly did enjoy reading it. Michelle Madow is a all around amazing author and at such a young age. I see more and more that her writing skills have grown and flourish. I can't wait to see what she comes up with next! To anyone who loves a good contemporary romance or who has ever wanted to know what it would be like to have a ton of money and live like a queen than I highly suggest this book. Michelle lives in Boca Raton, Florida, where she is writing more novels for young adults. She loves reading, spending time with family and friends, traveling, shopping, sunshine, Disney fairy tales, Broadway musicals (she's seen her favorite show Wicked 14 times! ), and spends way too much time on Facebook (/MichelleMadow) and Twitter (@MichelleMadow). Sounds like it may be a good beach read this summer! It really is. :) Thanks for stopping by! I enjoyed this one though I agree that the plot was mostly shopping and high school drama. Curious to see what happens when the girls start school! Yes, I hope to have more going on in the second book. I want to learn more about her Father and see the girls have a relationship with him. Sorry to hear that you didn't enjoy this one! I haven't heard very much about it, nor have I added it to my wishlist! But thank you for your honest review, you ROCK!